Enhance your home and garden with our range of contemporary outdoor lighting and LED garden lights. Illuminate driveways, patios, features and decking. Taylor Made Planters is proud to present our range of contemporary outdoor lighting. Garden lights can play a very important part in any landscape design by highlighting feature areas and creating wonderful, atmospheric effects. Our quality columns and wall lights are great for lighting up a driveway or pathway, adding ambience in your garden or delivering a striking statement in a commercial setting. All products come with a warranty and are easy to set up as they arrive fully assembled with a LED light. 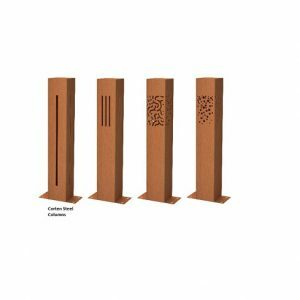 There are 3 sizes of landscape lights to choose from – 600mm tall columns, 400mm tall columns or wall lights with a length of 250mm, as well as 4 cut out patterns which create different effects when lit up. 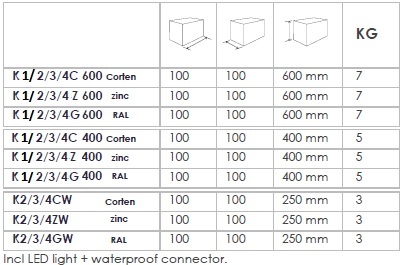 Once you’ve chosen the size and design you like, all that’s left to do is choose which material you would like your LED garden lights to be made from. We can supply them in Corten Steel with its popular rusty orange brown colour; Galvanised Steel which offers a more industrial look or finally, our outdoor garden lighting can be supplied in Powder-Coated Steel. This one is a customer favourite as coated Steel can be supplied in almost any RAL colour of choice so you can personalise the design to you and match your lighting with existing themes or décor. Our lighting range also matches our contemporary planters so you can create the perfect garden display. Let us know your preferences and we’ll get back to you with a free quote!